In addition to our standard Free support, ProxiBlue offers a Priority Level 2 support option. ProxiBlue generally deals with free support requests in a first come, first serve basis. Since the support is free, we can, at our discretion, swap between issues in the free queue. 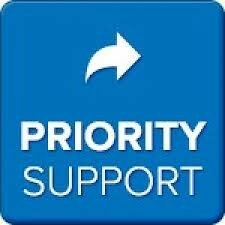 Priority support places your request at the top of the queue, above free support requests, and will receive attention before free support requests. We offer incremental higher levels of Priority Support, which is simply designated by the quantity purchased. Example: To get higher priority than the standard priority, simply purchase 2 Priority Support options, (set quantity to 2 in cart), more higher, 3 x quantity etc.